Quarters commemorating Theodore Roosevelt National Park in North Dakota were officially introduced to the public Thursday, Aug. 25, at an event in the park’s Painted Canyon Visitor Center. Congressman Cramer, Senator Hoeven, Principal Deputy Director Jeppson, Superintendent Ross, Deputy Regional Director Trap pose for a shot during the ceremony’s finale. U.S. Mint photo by Jill Westeyn. 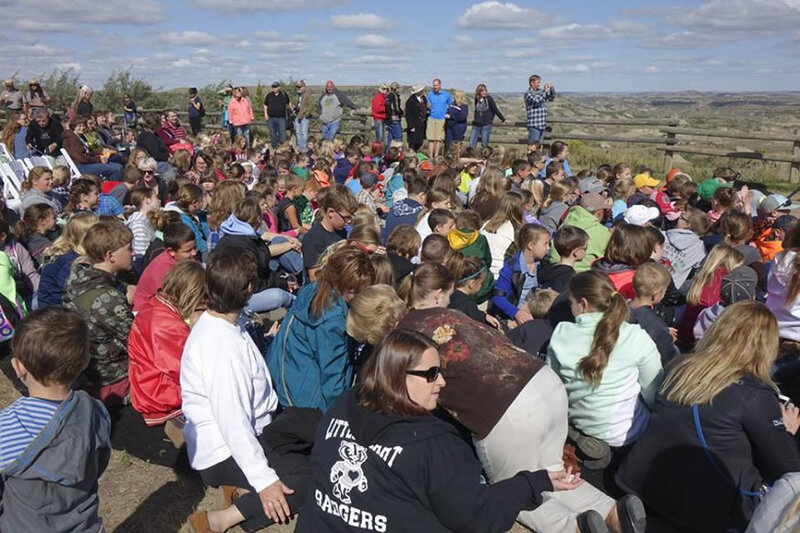 About 900 people attended the launch ceremony, including some 400 schoolchildren. 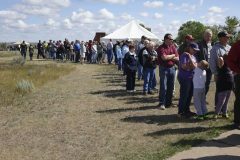 A crowd of 900 gather to celebrate the NPS Centennial and the launch of the Theodore Roosevelt National Park quarter. U.S. Mint photo by Jill Westeyn. After the event, kids received one of the new quarters for free while adults swapped cash for $10 rolls of them. First State Bank of Golva exchanged $18,000 in Denver-made quarters‎, according to United States Mint spokesman Michael White. Superintendent Wendy Ross presents a new quarter to a future numismatist. U.S. Mint photo by Jill Westeyn. 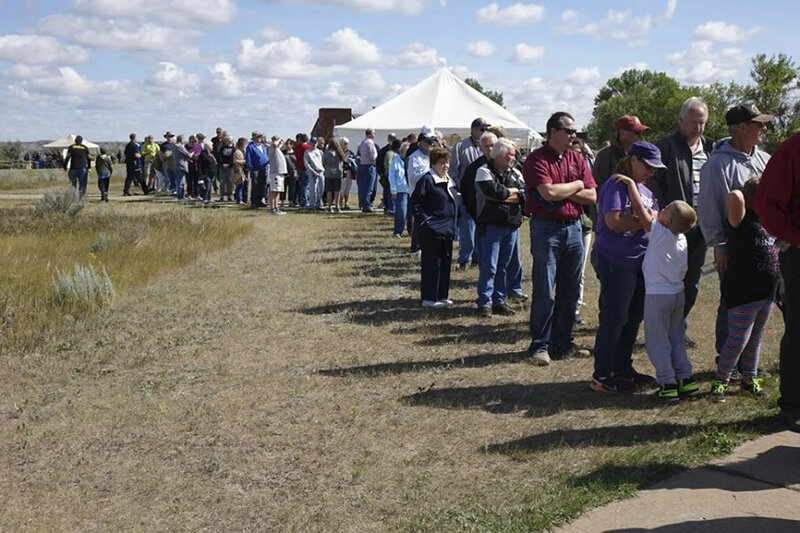 Attendees wait in line to exchange their cash for the new Theodore Roosevelt National Park quarters. U.S. Mint photo by Jill Westeyn. 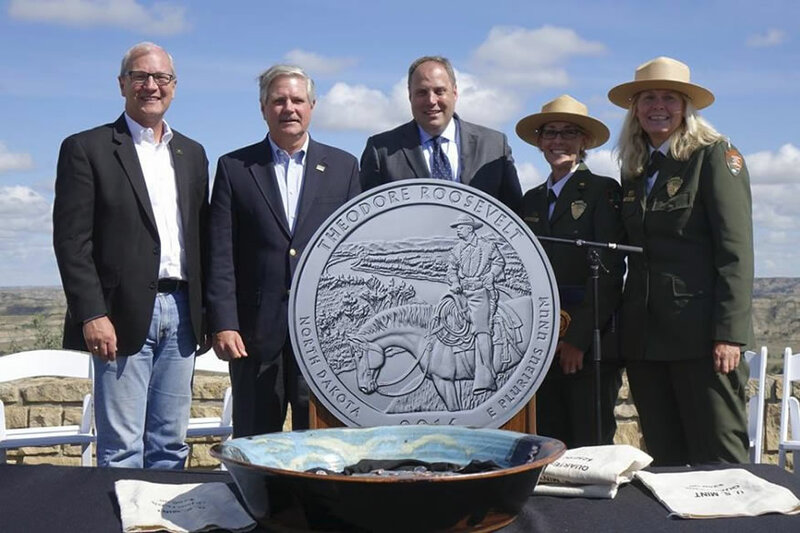 On hand for the ceremony were Senator John Hoeven, Congressman Kevin Cramer, National Park Service Deputy Regional Director Patricia Trap, Theodore Roosevelt National Park Superintendent Wendy Ross, and U.S. Mint Principal Deputy Director Rhett Jeppson. "This coin serves to memorialize the 26th President for his enduring contributions to the conservation of our nation’s resources, especially those found here in Theodore Roosevelt National Park," Jeppson said. The event coincided with the 100th anniversary of the founding of the National Park Service. The NPS oversees more than 400 sites covering about 84 million acres in the United States and its territories. 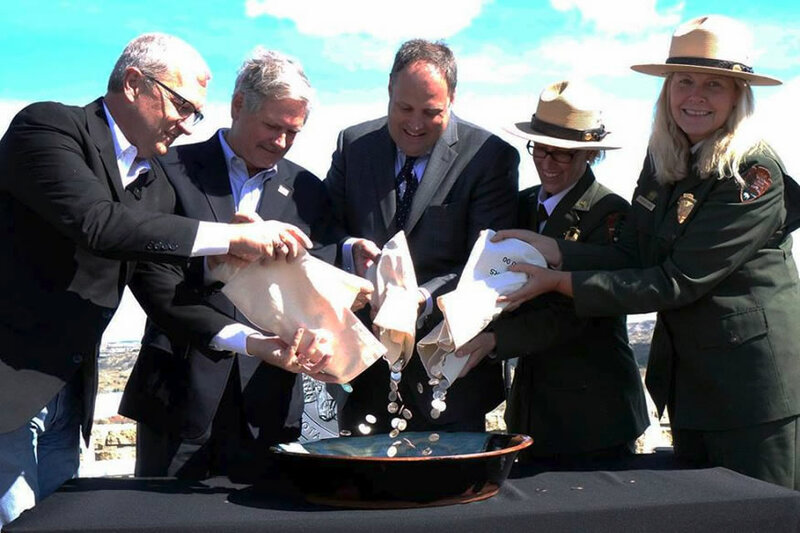 Congressman Cramer, Senator Hoeven, Principal Deputy Director Jeppson, Superintendent Ross and Deputy Regional Director Trap launch the new Theodore Roosevelt National Park quarter during the official coin pour. U.S. Mint photo by Jill Westeyn. Those who missed the launch ceremony don’t have to wait to find Theodore Roosevelt quarters in change. On Monday, the U.S. Mint released circulating-quality quarters in rolls and bags. Buying options include quarters made at the San Francisco, Denver and Philadelphia Mints at prices ranging from $18.95 to $46.95. 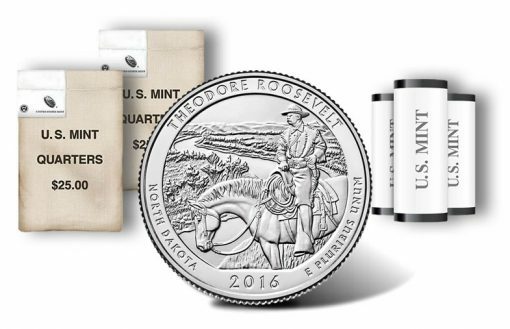 The U.S. Mint is now selling rolls and bags of Theodore Roosevelt National Park quarters. The coin depicts a young Roosevelt on horseback surveying the terrain near the Little Missouri River. A U.S. Mint-hosted coin forum, which drew an audience of 65, was held on the day before the ceremony. Coin forums offer a venue to express views and ask questions about existing, new, and upcoming U.S. Mint products. 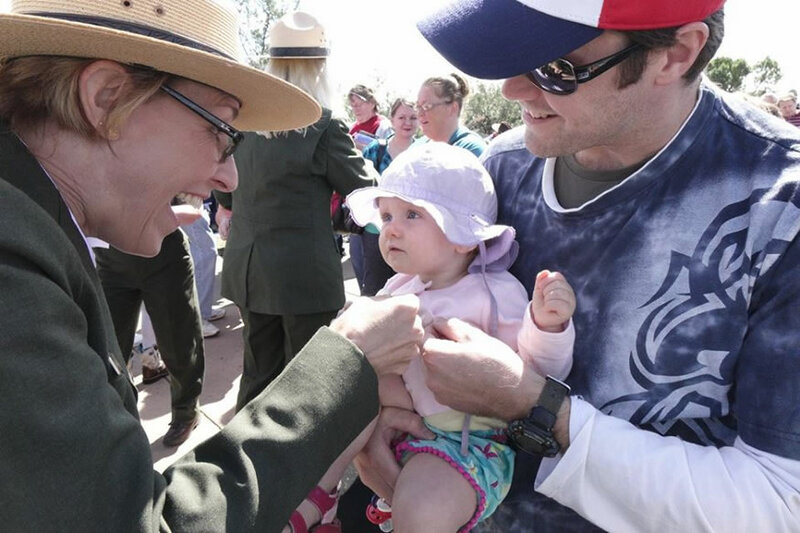 The America the Beautiful Quarters® Program started in 2010 and will celebrate 56 national parks and other national sites through 2021. The Theodore Roosevelt National Park quarter is the 34th release. A coin forum and launch ceremony for South Carolina’s Fort Moultrie (Fort Sumter National Monument) quarter is slated for Nov. 16 and 17. For more U.S. Mint photos taken at the ceremony, visit this Facebook link. Can you pick out Uncle Fester in the first US Mint photo?! Seriously though, it is a beautiful coin. My favorite ATB from this year.